Years of trial-and-error on mature whitetail bucks have taught the author a four-step process for pinpointing high-percentage stand locations. 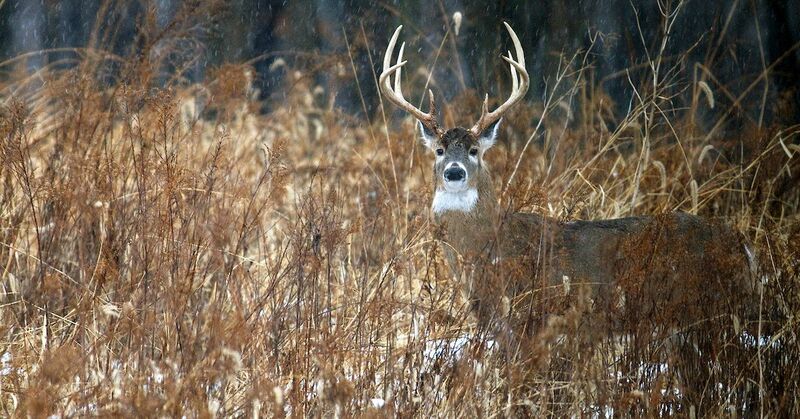 Large-size whitetail properties, whether open to the public or privately owned, can be really intimidating to tackle for the first time. With areas containing big blocks of timber, high ridges, deep draws, thick security cover, fence rows and large open pastures, it’s easy to get overwhelmed and anxious. Years of trial-and-error have taught me the importance of putting the puzzle together one piece at a time through detailed thinking. There is no perfect method to this. These are just some whitetail strategies I have developed over years of hunting a lot of public land and some big chunks of private. No two properties are the same, and even slight variables can change the game entirely. It’s best to approach each property with an open mind, be adaptable and understand how some or all of the information to come fits your specific situation. It seems that one of the most overlooked ways to initially assess the overall property is developing a base of good understanding of how the deer are utilizing the property. I’ve found the best way to do this is through the use of a good aerial map. I really like to use a Hunterra (www.hunterra.com) map (below) because they combine aerials with topo lines, and you simply can’t beat their detail. Hunterra maps combine aerial photos with topo lines, making scouting new areas much easier. The concept of “making the property small” simply means regardless of its actual size, back way out and look at how the specific property you’re hunting fits in amongst the surrounding properties. Whether you’re dealing with 10 acres or 1,000, this approach can tell you a lot about what your property offers the deer in relation to the neighbor’s land. The first thing I look for is food. The old saying that deer are slaves of their stomachs didn’t become a staple by happenstance. Generations of whitetail hunters have understood that hunting based on feeding locations and patterns is a tried-and-true strategy. Deer will know where the food is — both large agricultural sources and smaller-sized food plots — but they will also know where to find natural browse. Identify all of these sources early on in the process. Know where the food is on your property and on neighboring properties as well. Once you identify where the food is, you can anticipate where deer will likely be spending evenings, nights and early mornings on the property. Start planning the best ways in and out of these food sources without being detected. And, rather than posting up in a stand or blind right on a given food source, look for spots to intercept primary movement on the way to and from destination food sources. After you have the foundation for how food sources affect the property, it’s time to let the details tell you were to set up. Now that you’ve determined where the destination food sources are, you can begin focusing on finding your exact stand sites. Again, I always like to go back to my maps, and I focus on the areas around the food sources I’ve identified. I start looking for key points along the edges of food sources such as low spots, coves and points that jut out into a field. Upon finding these areas, I put boots on the ground and search these areas for whitetail sign. If sign is located, especially buck sign, I still don’t set a stand. This is what most hunters do, and I think it’s a mistake. Even though these areas offer cover, and even though they aren’t simply an open field, mature bucks won’t often make their way into these areas until after dark. When it comes to morning hunts, they will have often moved through the areas and headed off to bed before you can even get there, and even if you could, you would likely be bumping deer. Instead, I examine the trails leaving these just-inside-the-edge areas and explore deeper into the timber. As I go, I pay ultra-close attention to both deer sign and the type of land structures I’m moving through. Locate the mouth of a good trail that dumps into a primary food source. Now follow that trail deeper into the timber to find a solid ambush area. As I push further into the cover and start getting closer to possible stand locations, I become less concerned about deer sign in general and start looking for what I call “the right sign.” In many cases the best way to find mature buck sign efficiently is knowing where to look. This is when the details really matter. If you’re seeing a good concentration of deer trails, try looking on the predominantly downwind side of those trails for a fainter path where a buck would travel to search for does while keeping the rest of the deer upwind of him. If this area offers thicker habitat for security cover, even better. Also, start looking for bottlenecks and pinches where a buck would be naturally funneled into a tighter location. If you’re in an area with some elevation changes, work your way up the ridge to the upper third section on the leeward side. Bucks love to travel these areas with the wind coming over the top, and these areas usher in the added advantage of allowing bucks to be able to look down on the landscape below. Also look for thicker structure, saddles and benches that could steer bucks in a certain direction. Creeks and ditches are also great features to focus on for affecting how deer travel. If a creek or ditch holds water, that’s another bonus. Whitetail bucks love to work along the edges of these banks, and these water source allow doe-seeking bucks to quench their thirst. As you search waterways, keep an eye peeled for areas of the creek where it curves and pinches down between the bank and structure, allowing a narrow path of travel. Depending on the wind direction and what’s available as far as treestand locations, these can be incredible areas to utilize a natural funnel to your advantage. Just like any travel route you expect a mature buck to be utilizing, take your time to really look over all the subtle details that could influence his movement one way or the other. Each detail you find becomes an advantage for you, and gets you one step closer to finding an ideal ambush point. Don’t just amble through the woods looking for deer sign. Instead, pay attention to the subtle details that will dictate how a buck will traverse a given area. Now for the final piece to the puzzle. When it comes time to picking the tree or location I am going to set up in, I like to focus on a specific spot that puts me well within my effective shooting range of where I expect the buck to be, and also offers solid concealment. I try to determine what winds the buck will most likely be using when traveling the specific route as well. My goal is for my treestand to be right on the breaking point of the wind; by that, I mean the wind is almost right for him and almost wrong for me. This can be achieved by utilizing funnels to your advantage. One example would be setting up on a ridge. Imagine a trail in front of you to the north, running east and west. Based off scouting, sign and possible previous observations, you determine that a buck is mostly likely using the route on a north wind. By setting up on the south side of the trail, your wind is being carried off the backside of the ridge over a bottom. I primarily hunt out of treestands, but I’m in no way against sitting on the ground. The reason for my tree-going nature is the fact that the areas I hunt really lend themselves to hunting from a tree. That said, some of the things I really like to find in a specific stand site are multi-trunked trees, especially in oaks for example. Oaks keep their leaves longer than many other species as well, which provides great cover to break up your silhouette. Cedar trees are another great option. It’s going to require some work with a saw to trim out, but the cover a good cedar provides is nearly impossible to beat. Be sure, before trimming any trees or vegetation on public ground, that you check game and fish regulations. Laying the groundwork from the outside in has really helped me gain a great foundational understanding of how the whitetail properties I hunt lend themselves to the area deer populations. Learning to properly utilize maps, understand terrain, food sources and deer sign has been a game changer for knowing not only how, but where to set up on a specific property. Give it go, as I’m sure it will lead you to an encounter with a big brute or two. Pinpointing the whitetail 'X' enabled the author to arrow this mature whitetail.